[Y,E] = simulate(Mdl,numObs) simulates one sample path of observations (Y) and innovations (E) from the regression model with ARIMA time series errors, Mdl. The software simulates numObs observations and innovations per sample path. [Y,E,U] = simulate(Mdl,numObs) additionally simulates unconditional disturbances, U. [Y,E,U] = simulate(Mdl,numObs,Name,Value) simulates sample paths with additional options specified by one or more Name,Value pair arguments. Number of observations (rows) to generate for each path of Y, E, and U, specified as a positive integer. Presample innovations that have mean 0 and provide initial values for the ARIMA error model, specified as the comma-separated pair consisting of 'E0' and a column vector or matrix. If E0 is a matrix, then it requires at least NumPaths columns. If E0 contains more columns than required, then simulate uses the first NumPaths columns. E0 must contain at least Mdl.Q rows. If E0 contains more rows than required, then simulate uses the latest presample innovations. The last row contains the latest presample innovation. Default: simulate sets the necessary presample innovations to 0. Number of sample paths (columns) to generate for Y, E, and U, specified as the comma-separated pair consisting of 'NumPaths' and a positive integer. U0 must contain at least Mdl.P rows. If U0 contains more rows than required, then simulate uses the latest presample unconditional disturbances. The last row contains the latest presample unconditional disturbance. Default: simulate sets the necessary presample unconditional disturbances to 0. 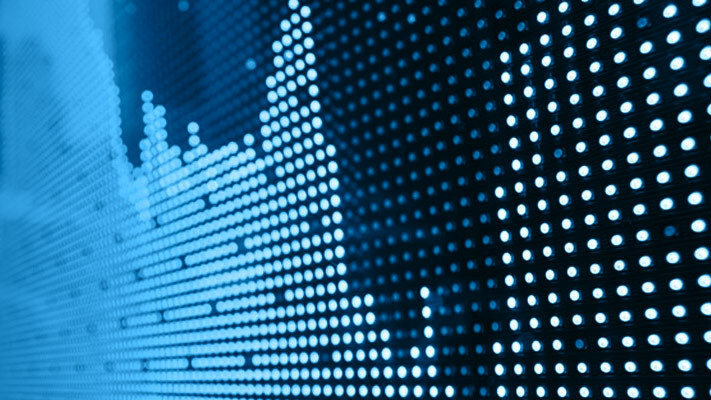 The columns of X are separate, synchronized time series, with the last row containing the latest observations. X must have at least numObs rows. If the number of rows of X exceeds the number required, then simulate uses the latest observations. Default: simulate does not use a regression component regardless of its presence in Mdl. NaNs in E0, U0, and X indicate missing values and simulate removes them. The software merges the presample data sets (E0 and U0), then uses list-wise deletion to remove any NaNs. simulate similarly removes NaNs from X. Removing NaNs in the data reduces the sample size, and can also create irregular time series. simulate assumes that you synchronize presample data such that the latest observation of each presample series occurs simultaneously. All predictors (i.e., columns in X) are associated with each response path in Y. Simulated, mean 0 innovations, returned as a numObs-by-NumPaths matrix. Simulate paths of responses, innovations, and unconditional disturbances from a regression model with SARIMA(2,1,1)12 errors. where εt follows a t-distribution with 15 degrees of freedom. Description: "Regression with ARIMA(2,1,1) Error Model Seasonally Integrated with Seasonal AR(12) and MA(12) (t Distribution)"
Simulate and plot 500 paths with 25 observations each. 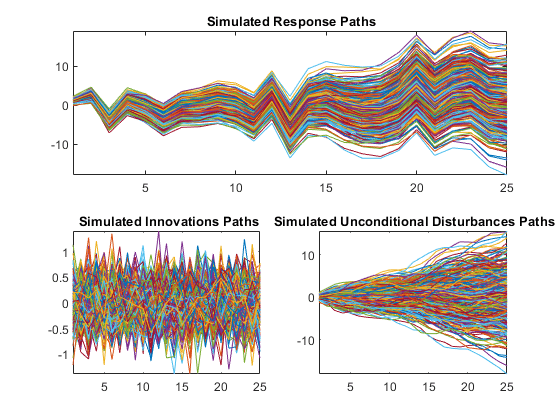 Plot the 2.5th, 50th (median), and 97.5th percentiles of the simulated response paths. Compute statistics across the second dimension (across paths) to summarize the sample paths. 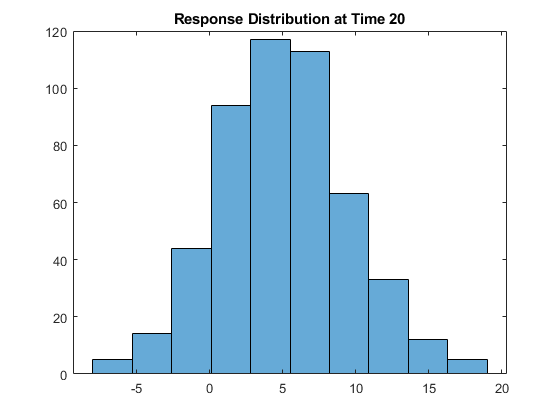 Plot a histogram of the simulated paths at time 20. 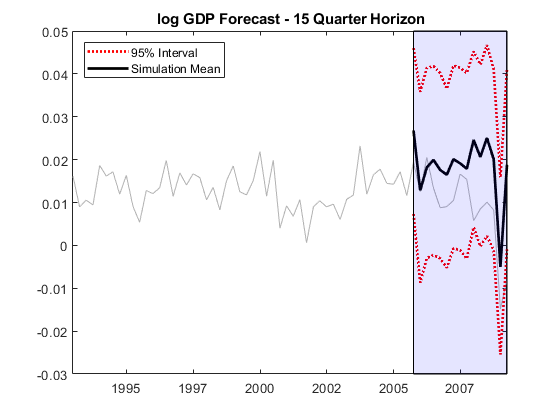 Regress the stationary, quarterly log GDP onto the CPI using a regression model with ARMA(1,1) errors, and forecast log GDP using Monte Carlo simulation. Simulate 1000 paths with 15 observations each. Use the inferred unconditional disturbances as presample data. 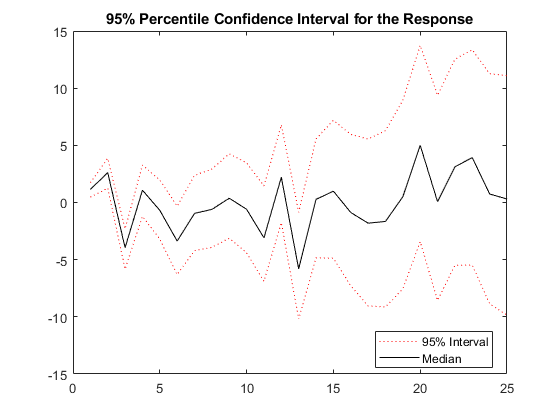 Plot the simulation mean forecast and approximate 95% forecast intervals. Regress the unit root nonstationary, quarterly log GDP onto the CPI using a regression model with ARIMA(1,1,1) errors with known intercept. 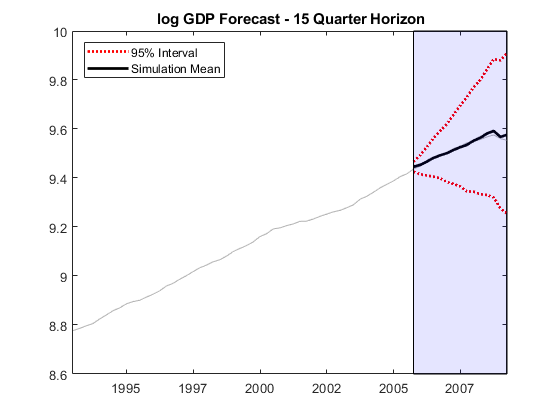 Forecast log GDP using Monte Carlo simulation. Fit a regression model with ARIMA(1,1,1). The intercept is not identifiable in a model with integrated errors, so fix its value before estimation.